Ungarn: GÄNZLICH UNERWÜNSCHT. Entrechtung, Kriminalisierung und Inhaftierung von Flüchtlingen in Ungarn. Because of the death of too many of our brothers and the fatal risks they have to take to cross the border from Turkey to Greece in order to make a better life for themselves, we are planning to gather at the border around Edirne on 15th of September 2015 and claim for our right to cross it safely. 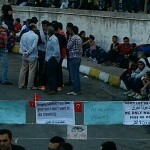 Undoubtedly, the unlicensed protest directed the attention to the situation of the refugees in Turkey. It was planned as a peaceful demonstration with thousands holding signs. 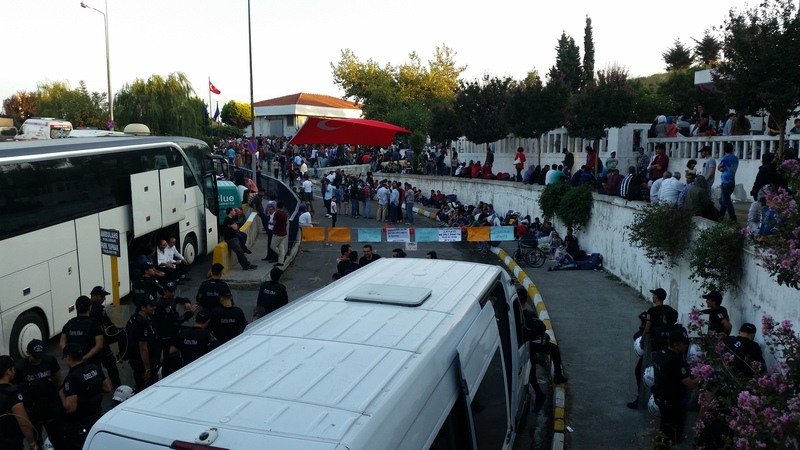 Already on Monday night hundreds of refugees left their cities to Edirne. 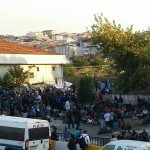 Many tried to walk to the border with Greece at Pazarkule but could not cross it. 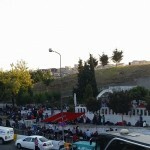 250 people were able to reach Edirne by foot and ended at the bus terminal. There they staged a sit-in. Police and Gendarmerie blocked many others from entering the city. Some were convinced to return to Istanbul. 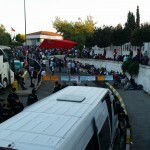 More than 1000 people entered again the city of Edirne, but were blocked from going to the border with buses. More than 600 people are currently blocked at the bus station, some of them have started a hunger-strike. It’s important to believe that our cause is right and the concerned agencies should take the responsibility to work with migrants. Therefore, we prepared a petition that we all invite you to sign and support. The protest of the revolting people at the Istanbul bus station is targeting especially Turkey and Germany, by holding Turkish flags and signs with slogans addressing Germany’s Chancellor. 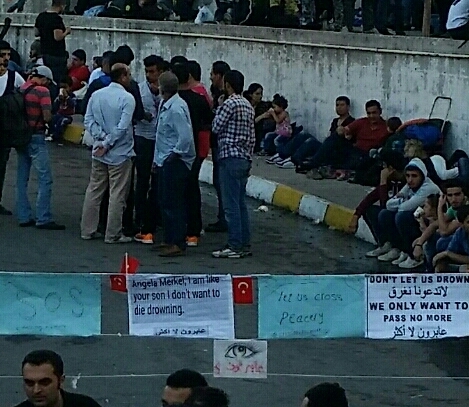 Other signs are thematizing the problems, which migrants have in Turkey. They state that no more people should be let to drown. Today again more than 20 people drowned at the coast in Bodrum. Even in the Istanbul quarter of Aksaray the selling of life jackets has increasingly become a business. The protest of migrants, fleeing from broken homes and looking for a new life this time got more attention than the exodus of more than 30 buses, that tried to move through the Turkish-Bulgarian border in June 2015. During the new occupation of the bus stations in Istanbul and Edirne, the migrants stated that they will not surrender until they are allowed to cross the border peacefully. Winter is coming soon, so there is no doubt that the people who are reclaiming their rights to move freely and who have been caught into the limbo of a political and humanitarian crisis, will be trying their luck by the end of the long summer of migration. They have nothing to lose. Der gemeinnützige Verein bordermonitoring.eu e.V. wurde 2011 in München gegründet. Im Zentrum der Tätigkeiten des Vereins steht die Auseinandersetzung mit den Politiken, Praktiken und Ereignissen im europäischen Grenzregime und in den Bewegungen der Migration. Zu diesem Zweck kombiniert der Verein wissenschaftliche Forschung, bürgerschaftliches Engagement, kritische Öffentlichkeitsarbeit und konkrete Unterstützung für Flüchtlinge und MigrantInnen. Der Verein leistet damit einen Beitrag zur Veränderung der Realität an den Grenzen und ihrer Konsequenzen für die Gesellschaften in Europa. The charitable association bordermonitoring.eu e.V. was established in Munich in 2011. The focus of the association's work is on the debate about the politics, practices and events surrounding the European border regime and about migration movements. 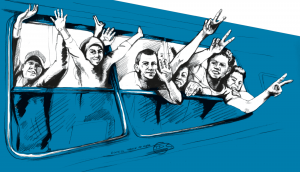 To this end the association combines scientific research, political commitment and critical relations activities with concrete support for refugees and migrants. In this way the association contributes towards a change in the realities at the borders and in their consequences for European society.